Rockstar Games has taken the Grand Theft Auto V ad blitz viral, with a new site seeking followers for a religion dubbed the "Epsilon Program." Since Grand Theft Auto III, each game in the series has featured dozens of jabs at modern culture. 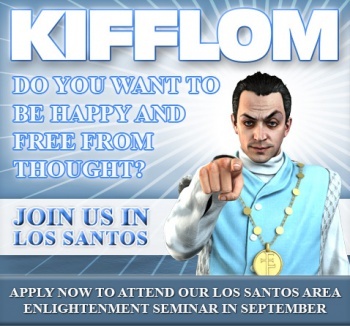 From crass consumerism to American foreign policy, the Grand Theft Auto developers have a throwaway gag for everything, and their next target is apparently Scientology. A new site recently launched by Rockstar Games asks potential converts if they "want to be happy and free from thought," before asking potential Grand Theft Auto V players for their personal info. It's not what it seems however. Instead of joining a virtual religion, dropping your info (and, most crucially, a photograph) into the website instead inserts your name into a pool of potential characters for the upcoming open-world sandbox game. According to the "Terms" section of the viral site, the Epsilon Program is actually a sweepstakes of sorts, designed to give fans "an opportunity to be cast as one of five Epsilon Program members in Grand Theft Auto V."
There's no word on how extensive a role as an Epsilon Member might be, but if past games are any indicator, we expect these devout followers to voice a few lines heard at random by the player which take blatant shots at organized religion as a whole, and in particular, Scientology. Why Scientology? Rockstar's reasoning appears simple: Since it was founded in 1952, the church of Scientology has been the target of numerous controversies. In recent years it has attracted a number of prominent Hollywood stars (most notably, Tom Cruise), and their involvement, coupled with the church's hyper-secretive nature and seemingly alarming practices have made Scientology a popular go-to institution for those hoping to decry the practice of blindly following any organization. Plus, Rockstar needs to fill its quota of recognizable, modern groups at which the in-game radio stations in Grand Theft Auto V can take a swing. It just wouldn't be a GTA game without blunt satire filling the virtual airwaves. If you're interested in joining the Epsilon Program, you have until midnight on May 27 to drop your personal information into the virtual hat. We've got no idea what happens from there, but if you're selected, expect Rockstar to be in touch.